Saint John of the Ladder is honored by the Church as a great ascetic and author of the renowned spiritual book called THE LADDER, from which he is also called “of the Ladder” (Climacus). There is almost no information about St John’s origins. One tradition suggests that he was born in Constantinople around the year 570, and was the son of Sts Xenophon and Maria. John went to Sinai when he was sixteen, submitting to Abba Martyrius as his instructor and guide. After four years, St John was tonsured as a monk. Abba Strategios, who was present at St John’s tonsure, predicted that he would become a great luminary in the Church of Christ. For nineteen years St John progressed in monasticism in obedience to his spiritual Father. After the death of Abba Martyrius, St John embarked on a solitary life, settling in a wild place called Thola, where he spent forty years laboring in silence, fasting, prayer, and tears of penitence. It is not by chance that in THE LADDER St John speaks about tears of repentance: “Just as fire burns and destroys the wood, so pure tears wash away every impurity, both external and internal.” His holy prayer was strong and efficacious, as may be seen from an example from the life of the God-pleasing saint. St John immediately woke up and began to pray for his disciple. When Moses returned in the evening, St John asked whether any sort of misfortune had befallen him. The monk replied, “A large rock would have fallen on me as I slept beneath it at noon, but I left that place because I thought I heard you calling me.” St John did not tell his disciple of his vision, but gave thanks to God. The following example of St John’s humility is noteworthy. Gifted with discernment, and attaining wisdom through spiritual experience, he lovingly received all who came to him and guided them to salvation. One day some envious monks reproached him for being too talkative, and so St John kept silence for a whole year. The monks realized their error, and they went to the ascetic and begged him not to deprive them of the spiritual profit of his conversation. Concealing his ascetic deeds from others, St John sometimes withdrew into a cave, but reports of his holiness spread far beyond the vicinity. Visitors from all walks of life came to him, desiring to hear his words of edification and salvation. After forty years of solitary asceticism, he was chosen as igumen of Sinai when he was seventy-five. St John governed the holy monastery for four years. Toward the end of his life, the Lord granted him the gifts of clairvoyance and wonderworking. At the request of St John, igumen of the Raithu monastery (Commemorated on Cheesefare Saturday), he wrote the incomparable LADDER, a book of instruction for monks who wished to attain spiritual perfection. Knowing of the wisdom and spiritual gifts of St John of Sinai, the igumen of Raithu requested him to write down whatever was necessary for the salvation of those in the monastic life. Such a book would be “a ladder fixed on the earth” (Gen. 28:12), leading people to the gates of Heaven. St John felt that such a task was beyond his ability, yet out of obedience he fulfilled the request. 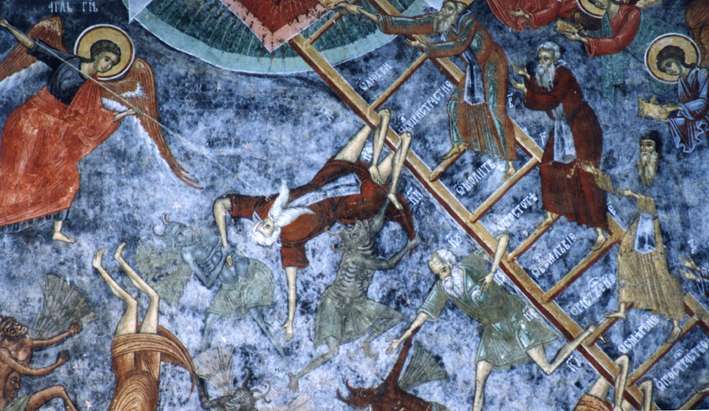 The saint called his work THE LADDER, for the book is “a fixed ladder leading from earthly things to the Holy of Holies….” The thirty steps of spiritual perfection correspond to the thirty years of the Lord’s age. When we have completed these thirty steps, we will find ourselves with the righteous and will not stumble. THE LADDER begins with renunciation of the world, and ends with God, Who is love (1 John 4:8). Although the book was written for monks, any Christian living in the world will find it an unerring guide for ascending to God, and a support in the spiritual life. Sts Theodore the Studite (November 11 and January 26), Sergius of Radonezh (September 25 and July 5), Joseph of Volokolamsk (September 9 and October 18), and others relied on THE LADDER as an important guide to salvation. The twenty-second step of THE LADDER deals with various forms of vainglory. St John writes: “When I fast, I am vainglorious; and when I permit myself food in order to conceal my fasting from others I am again vainglorious about my prudence. When I dress in fine clothing, I am vanquished by vanity, and if I put on drab clothing, again I am overcome by vanity. If I speak, vainglory defeats me. If I wish to keep silence, I am again given over to it. Wherever this thorn comes up, it stands with its points upright. In THE LADDER St John describes the ascent toward spiritual perfection, which is essential for anyone who wishes to save his soul. It is a written account of his thoughts, based on the collected wisdom of many wise ascetics, and on his own spiritual experience. The book is a great help on the path to truth and virtue. Previous Post A Brief Intro! Next Post The Church Of Angels!